The Marx brothers classic Duck Soup contains a bit that applies nicely to the bellicose Pirates Of The Caribbean trilogy, which reaches its conclusion with the nearly three-hour At World's End. When presented with a treasury report, Groucho's Rufus T. Firefly, the newly appointed President of Freedonia, declares it so simple that even a 4-year-old child could understand it. "Now run out and find me a 4-year-old child," he says. "I can't make head or tail of it." As a consequence of trying to turn a theme-park ride into a 463-minute trilogy, the Pirates movies are freighted by so much convoluted mythology and supernatural hoo-hah that perhaps only the very young can understand their dream logic. The last, longest, and most tedious of the bunch, At World's End sags under reams of exposition that not only fail to clarify the story, but take away from the slapstick tomfoolery that made the first film (and a couple of sequences in the second) escapist fun. Picking up where the second entry, Dead Man's Chest, left off, the new film finds bland heroes Orlando Bloom and Keira Knightley teaming up with the once-dastardly Captain Barbossa (Geoffrey Rush) to find Johnny Depp's Jack Sparrow, who's trapped in Davy Jones' locker. Here's where things get confusing: Bloom and the gang must first go through Singapore to get a special navigational map from Chinese pirate Chow Yun-Fat, who's one of several pirate lords who must unite in order to secure pirate freedom in the Seven Seas. (There's also some business about a "Brethren Of The Coast," and the "nine pieces of eight," but let's not get ahead of ourselves.) Meanwhile, the East India Trading Company has possession of Davy Jones' beating heart and has brought Jones and his Flying Dutchman ship into its quest to eradicate pirate-kind. And then there's Sparrow, whose predicament has left him with several metaphysical manifestations. 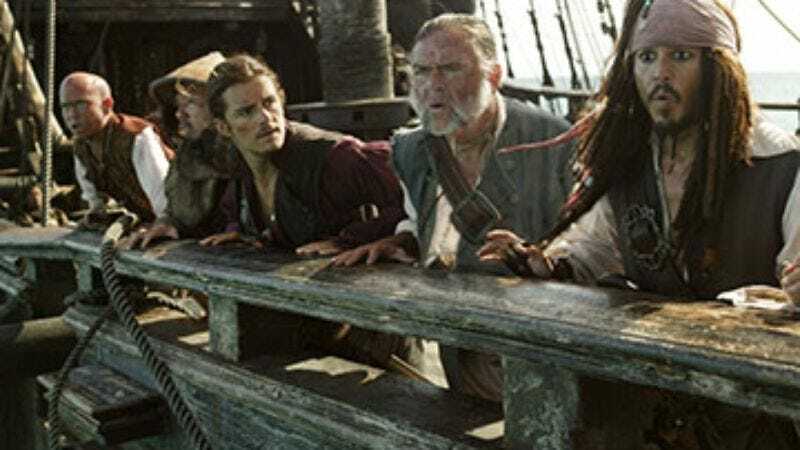 The Pirates Of The Caribbean trilogy—and At World's End especially—stands as a lesson in the perils in blockbuster filmmaking: What started out as a fleet one-off swashbuckler with novel supernatural elements has become loaded and graceless, with each new entry barreling across the goal line like William "The Refrigerator" Perry. The franchise's two chief assets—the surprise of Depp's swishy pirate and Gore Verbinski's dexterity at directing slapstick action sequences—have been eclipsed by expository scenes that confuse even more deeply in their attempt to clear things up. Should the franchise warrant still another sequel, the dialogue might as well be in Esperanto.